It is a common situation when several team members use the same Salesforce account. They might also want to set up synchronization between Reply and Salesforce. This requires following up a common rule while setting up synchronization from Reply to Salesforce and back. Otherwise Reply may override contacts (leads) in Salesforce several times. Separate your contacts by owner. Each owner has their unique Owner ID. For more information on how to find your Owner ID in Salesforce, see the following article. Create a custom field called Owner ID. 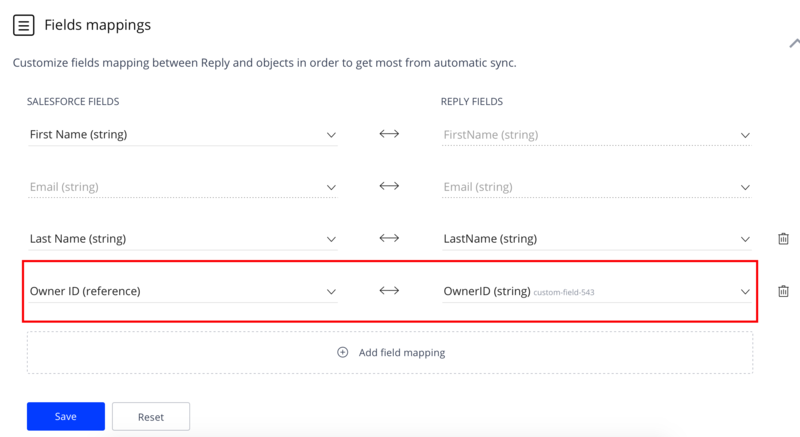 You will use this field when setting up synchronization from Salesforce to Reply. For more information, see the How to Create and Edit Custom Fields article. Create a smart filter that contains the Owner ID field. You will use this filter when setting up synchronization from Reply to Salesforce. For more information, see the How to create and use smart filters article. In the Fields mappings section, map the Owner ID field (Salesforce) with the previously created OwnerID field (Reply). 2. In the Filtering rules section, create a filtering rule where the Owner ID field equals your Owner ID in Salesforce. If you set up everything properly, your contacts will not be messed up with your team mate's contacts in the Salesforce account.